Whether you live in a warm climate or it’s almost summer and time to fire up your backyard grill for those delicious backyard burgers. However, your burgers are only as good as your ingredients. So here’s a guide to what to use to create this year’s best backyard burgers. It’s almost summer and time to fire up your backyard grill for those delicious burgers. However, your burgers are only as good as your ingredients. So here’s a guide to what to use to create this year’s best backyard burgers. You will want to use ground chuck which is a blend of 80 percent lean to 20 percent fat. Any leaner and your burger patty will be dry like a hocky puck. If you like thick burgers, just leave the meat on the grill and let the fire do the work (takes a little longer). If you prefer thin patties, place the burger in a cast iron pan or griddle, mash with a press or solid spatula to get a nice sear, and then cook to your desired doneness (it won’t take long). Keep it simple – it’s not necessary to add exotic seasonings to your beef. Your basic salt and pepper work just fine. If you want cheese on your burger, let it melt on the burger before you take it off the grill. You can use your favorite cheese – what cheese isn’t good on a burger? If you are on a budget, a deli American cheese is an excellent and inexpensive choice. Did you know that there are about 2,000 different types of cheeses and that each cheese has its distinct characteristics? Here’s a list of the most popular cheeses for burger toppings. Mozzarella: Some cheeses are explicitly created for cooking and baking, and in that category, mild mozzarella is the king. Mozzarella is mild enough that it doesn’t interfere with other flavors. Provolone: If you are looking for a cheese with more flavor than mozzarella, then consider provolone which has all the features of mozzarella plus it has some additional flavor than Mozzarella. Goat Cheese: Who knew that such a simple cheese could taste so good? Goat cheese delights with its pristine white color and distinct flavor. A humble basic for some; a gourmet delight for others. Goat cheese is light on calories but tangy on the taste buds. Monterey Jack: Monterey Jack deserves the right to be called a true American cheese since it began life with the Mexican Franciscan friars in Monterey, California. This is one of the best mild cheeses for melting, making it a super-gooey cheese topping for your burger. American Cheese: Although often derided as an “ungourmet” cheese, American cheese is the resounding champion of melty cheeses. Why? Because it adamantly refuses to come apart when melted, providing for a yummy pool of cheese atop your burger. What you get is a really melty, scrumptious cheese topping. Cheddar Cheese: This is perhaps the second most popular option behind American cheese. The original Cheddar cheese was made in the village of Cheddar in England. It’s a firm cheese that comes in flavors ranging from mild to sharp and in colors from white to pumpkin orange. The orange hue comes from annatto, a natural dye. There’s a Cheddar for every taste bud. Smoked Gouda: Gouda originated in the city of Gouda in the Netherlands and is now made by artisan cheesemakers throughout the world. The smokiness comes from being smoked in brick ovens over hickory chip embers. If you are going for a smoky barbecue sauce on your burger, then smoked Gouda is a perfect match. Blue Cheese: The name blue cheese covers a group of cheeses that are distinguished by containing cultures of the mold Penicillium, so that the final product is spotted or veined throughout with blue, or blue-grey mold. This imparts to the cheese its distinctive aroma and taste. If you like your cheese to be pungent, salty, and stinky, go for a blue cheese such as Stilton. A soft burger bun that will hold up nicely to the burger’s juices is a good choice. The ideal bun surrounding your burger should be squishy, pillowy, and tender, with a crumb that is soft but not tight and slightly sweet. The ideal bun should not disintegrate halfway through your meal. Toasting the bun lightly will help to make it firmer. Here’s a list of seven contenders for the best burger buns found in most supermarkets (following testing by the Burger Lab). There’s a lot to be said in favor of sticking with the classics and keeping things simple. Traditional toppings include fresh ingredients, such as lettuce and tomato. And, bacon always goes well with cheeseburgers. Add some taste zing with onions, pickles, and condiments such as ketchup, mustard, or mayo. Lettuce: With respect to lettuce, the goal is to provide crunch and flavor that can stand up to the rest of the mix. Iceberg and romaine are two of the best options. However, whichever type of lettuce you choose, it must be fresh and crisp. Tomatoes: A slice of tomato adds a touch of color and tangy fresh juiciness to your burger. Among the many varieties of tomatoes, the firm texture of a fresh, plump, sliced beefsteak tomato makes it a favorite with restaurants, fast food outlets, and home grillers. Onions: A burger with no onions is like a movie with no popcorn. You’d still indulge, but deep down you’d know that something was missing. I prefer red onion for taste and color both. Here’s a veritable treatise from the Burger Lab on different ways to use, cook, and slice onions for burgers. How Does Your Burger Stack Up? What’s the best way to stack your burger? Instead of just piling everything on, build your burger in a certain way to help prevent the escape of rogue ingredients (I’m looking at you tomato) and also enhance the flavor of your burger. Here’s how to do it. Start with the bottom bun (obviously!) which you’ve toasted slightly. Spread your chosen condiment (ketchup, mustard, or mayo) directly on the bun so that it stays in place and doesn’t end up on your shirt. Next up is pickles – place them under the meat so their strong crisp flavor doesn’t overpower that of your tomato. Add your meat with your melted cheese on top and then your tomato. If your cheese is melty enough, it should keep the tomato from straying when you take that first bite. Add your lettuce – it will act like a blanket to help keep the tomato in place – and then your onion. Finally, top your stacked burger off with your toasted top bun and ta da! – you’re all set. 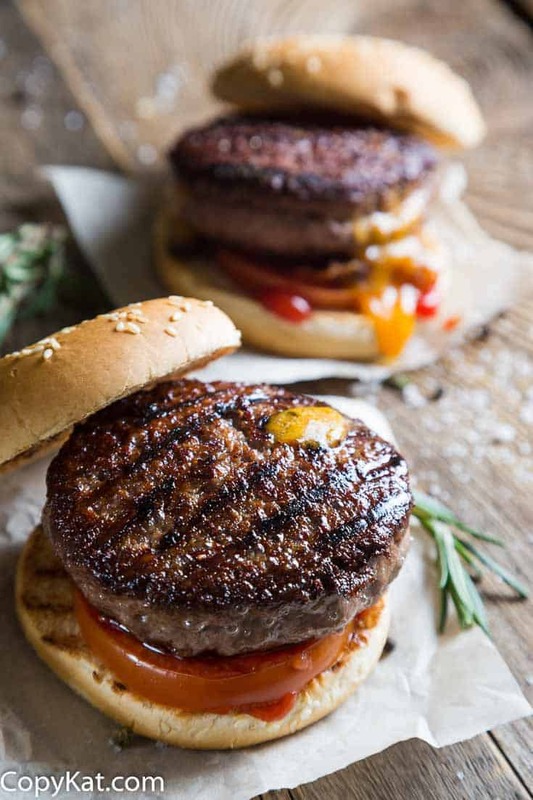 If you want to make a batch of burgers and put them in your freezer, remove them from the grill when they are less cooked than you prefer. When cooled, vacuum seal them and put them in the freezer. When you feel like a burger, you can just take one out and pop it in the microwave – you will still get that grilled burger taste. Actually, this makes for a juicier burger then if you cooked one to well done and ate it right from the grill. So, get grilling and enjoy your summer burgers all year round. In a bowl combine ground chuck, salt, and pepper. Stir to combine. Form four patties that are about 3/4 inch thick.Clean your grill. It is important to start with a clean grill. The burgers will taste better, the burgers will not stick, and it helps you make those pretty grill marks on your burger patty. Set or moderate your temperature. Cook the burgers on medium-low to medium heat. My preferred temperature is 350 degrees F. You can test the temperature with a Thermapen if your grill does not have a thermostat.Once you have placed the patties on the grill try to turn them only once. The more often you turn the burgers the more likely you are to squeeze out the juices.Burgers should cook for 6 to 8 minutes on each side. You can test the temperature of the patty by inserting a meat thermometer into the patty. Ground meat patties should reach a temperature of 160 degrees F. Remove patties from grill.Assemble your burger with your preferred toppings. wooohoooo qualifying cookies 24-7 I LOOOOOVVEE it. That sounds like a sweet life to me. Lot’s of great cooking tips here. 1) Long gone, but not forgotten, Noonan’s and the best seasoned spare ribs ever. Known as simply as NOONAN’S RIB’S. A few restaurants featured them, and they were available at a few small specialty markets, and at their small plant/store on Western Ave. in south-east L.A. for home B.B.Q. 2) The main signature dish of a specialty shrimp stew/broth (served in a large soup bowl) restaurant which serves among other related dishes…eat with your fingers unshelled shrimp boiled in a super delicious spicy orange colored broth that you can dip a bunch of French bread into this meal in a bowl. The name of the restaurant is also the name of their peak and eat main featured meal………….KILLER SHRIMP! It sure would be a great fall/winter party meal. Oh, and “thank you Stephanie”!!! We made these over Labor Day weekend. Best. Burgers. Ever. 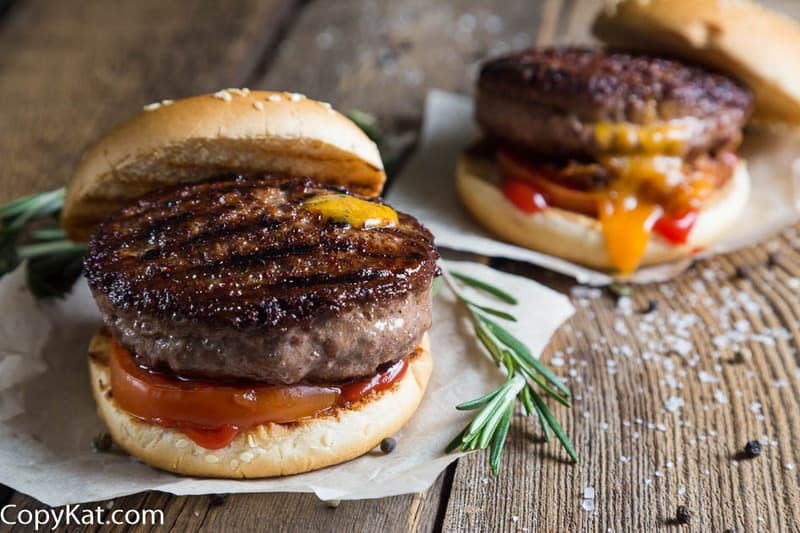 I appreciate the tips in this post, my burgers were improved when I made them last weekend! Do you have any recipes from a restaurant called OKRA’S? My grandson ate there and he loves their scallops. I don’t know of an Okra restaurant close to my home in NC maybe on the coast or up north of NC. Thank you for your comment, I don’t have any recipes from Okra’s, I appreciate the suggestion. What type of meat do you use??? 80/20? 70/30? 90/10? Nothing! Isn’t the burger the main character? Ground chuck is usually 80/20, I will add that to that ingredient so it is more specific. Thank you for your comment. Much appreciated. Great tips, Stephanie! I’m going to put some of them to use for sure! I can’t make burgers without roasted green chiles on them. I buy at least 2 bushels every year and freeze them. Add the chopped chiles on the final flip of the burger. Top the chiles with a slice of American cheese and let it melt. This encases the chiles and keeps them in place for easier eating. I love those hatch chilies! I am about 2 months away from those right now. You forgot to mention putting a dimple in the middle of your burger patty (about the size of a mans thumb). This will prevent “pillowing,” where the burger swells up in the middle while cooking. I am going to try the butter tip! Put a small pat of butter inside the burger when forming it. Keeps the meat super moist and tasty.